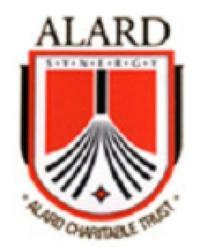 Course fee in Alard College of Engineering and Management is Rs. 91,000 + Rs. 50,000 (hostel fee) Given by only DTE. An average number of students 10 to 12 gets a scholarship. Yes, Maharashtra bank provides a loan. 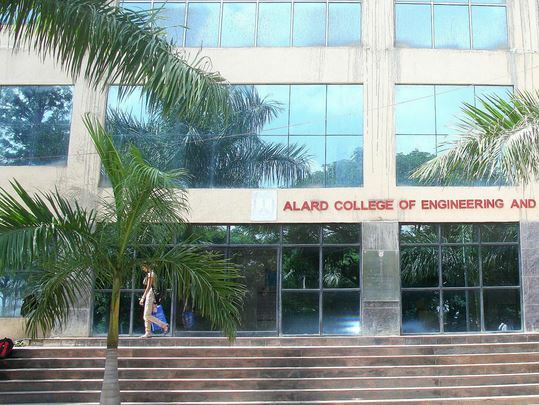 Alard College of Engineering and Management, Hinjewadi, Pune – 411 057 (ACEM) established in 2009 by Alard Charitable Trust is one of the top engineering colleges in Pune. The institute offers five undergraduate engineering programmes of four year duration namely Mechanical Engineering, Electronics & Telecommunication Engineering, Computer Engineering, Civil Engineering, and Electrical Engineering. Two engineering departments (Mechanical Engg and Computer Engg) are offering post-graduate programs (ME). It was started with a clear objective of providing quality technical education with international standards. Alard College of Engineering and Management, Hinjewadi, Pune – 411 057 is recognized by AICTE New Delhi and DTE, Government of Maharashtra, and is affiliated to Savitribai Phule Pune University. ACEM is considered to be one of the best engineering colleges in Pune. Alard campus have the privilege of being the most modern and sophisticated premier technical institute imparting professional education. We know higher education is still available only to a thin slice of India’s young and Engineering Institutions is a place where talents are groomed, skills are nurtured, competencies are developed and the architects of tomorrow are built. Alard College of Engineering and Management, Pune stands for quality, that moves towards perfection. The utilitarian mission is to provide skilled and motivated manpower catering to the burgeoning industrial needs and also to train students on cutting edge technologies. The College provides good academic and social environment to the students, The College has developed the state-of-the art infrastructure, well equipped laboratories, modern library, state of-the-art computer center, classrooms equipped with ultra-modern teaching aids and multimedia projection facilities, hygienic cafeteria, sufficient parking space, playground & well equipped gymkhana, etc. These facilities create conducive environment for teaching- learning process. The college has appointed well qualified, experienced, dedicated and result oriented faculty who are committed to the overall growth of the students and the institute. Along with excellent teaching and learning facilities, this college has done MoU’s with industrial trainers to provide the required and adequate training to each student. So that every student would get selected in the campus recruitment very easily with higher starts. College is providing very excellent training to each student from result oriented track record professional trainers. These trainers are giving training and monitoring each student until students gets proper placement in core or IT industry. These trainers are trying to update the knowledge of students in such a way that our students are placed with highly paid jobs in various corporate organizations. Application of modern technology in the teaching-learning process and day-to-day governance of the college makes ACEM unique and counted in the top engineering colleges in Pune and at national level also. The college is not only dedicated to making excellent quality of professional engineers but also good human beings who can create a niche for themselves in the society. In a nutshell, ACEM sets benchmarks for excellence and hence produces not only Engineers but the leaders of tomorrow who are ready to face the challenges of this ever-changing and fast moving world.